Back to Puke, Purge and Blister ? Since 1888 when the first Osteopath put forth the Principles of Osteopathy and a comprehensive therapeutic program that was much more than puke, purge and blister which was the practice of “Medicine” at that time and as a result was run out of Kansas and went to Kirksville MO where he established the first College of Osteopathy and after 6 years began the American Osteopathic Association which is now in the process of ending the degree of DO and sending all graduates of DO colleges of Osteopathic Medicine to ACGME programs approved by the ABMS and they will certified by the ABMS boards and there will be no more Osteopaths. students are astounded by the way we practice as we practice Osteopathy that is far advanced from that which is currently taught at Osteopathic Colleges of Osteopathic medicine. They are seeing patients that revere our way of practice. We are putting all we can muster in establishing The American Association of Osteopathic Physicians and plan on being Osteopaths in our organization. We have established American Boards of Osteopathic Specialties to provide certification in all specialties. We are interested in how many may join us. I’m a DO, and it is a beautiful thing. We must keep our identity. We must fight the system that wants to change a good thing. Osteopathy needs to stay unchanged, and it needs to be practiced as it was practiced in the past, without insurance involvement because it is the big corporate insurance companies that just couldn’t understand our language so they have attempted to destroy it. Harvard has dealt us serious blows because it’s the allopathic profession that is clueless to the medical practice of Osteopathy, yet they are the ones in positions to judge, and define reimbursement for an area of medicine that they just don’t know. We are not allopathic physicians, and we never will be, and never care to be so we need to stop holding DOs to the same standards as the MDs were trained. We are not trained the same that is why we don’t take the same boards; we are very different! To My Fellow Osteopathic Physicians: It is incredible how dysfunctional many of the AOA administrative departments have become. One of the biggest problem with the AOA is the empire that John Crosby built over the past ten years. It is an empire that the AOA directors do not recognize and do not know how to dismantle. A prime example is the AOA administrative leader who told us that a lecture on the use of the new defibrillator was inappropriate for practicing osteopathic physicians. CLICK HERE to download this letter and table of resolutions in PDF format. The House of Delegates (HOD) and all practicing DOs must demand the AOA stop their policies toward ACGME merger as proposed, OCC/MOC, MOL, and they must begin to support their osteopathic physician membership unconditionally against ALL competing interests. Please read 10 point questions below that have been asked of the AOA for answers they have continued to not answer for 3 years this September 2014. If any of the questions raise your “index of suspicion”, contact your AOA State Delegates immediately and prior to the meeting next week, beginning Friday, July 18. 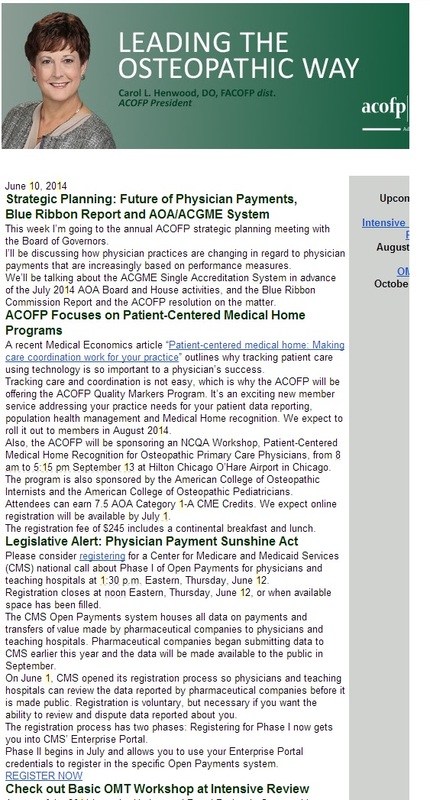 The COMPLETE 168 resolutions pending are at the following link: http://www.osteopathic.org/inside-aoa/events/annual-business-meeting/house-resolutions/Pages/default.aspx Please read them and decide for yourself what you might be for or against. A bulleted list below, of some of the relevant resolution agenda numbers and titles will be followed by recommendations “for or against” them in reference to a large body of physicians in the trenches whose voices are not being listened to by any of the “elected authorities for which our dues pay”. We as individual Osteopathic Physicians, Osteopathic State Associations members, and as diplomates of Subspecialty Colleges, must take action to change AOA policy direction. Our Osteopathic practice of medicine, our patient populations and our ability to support our families hang in the balance. 1. Why is AOA forcing ACGME merger (takeover of OGME)? What alternatives have also been explored? Why would any organization walk away from millions in government funding that maintain our own unique OGME? 2. Why is AOA pursuing osteopathic continuous certification and maintenance of certification (OCC/MOC) when they are time and money prohibitive for DO physicians? Osteopathic CME has always been flexible and more than adequate. 3. Why is AOA pursuing maintenance of licensure (MOL) against state board autonomy, DO state association preferences and physicians professional independence? 4. Why is AOA not fighting NP and PA expanding practice rights in each state? They are practicing medicine independently in increasing numbers of states without having to complete a full curriculum in medicine. That is condoning malpractice. 5. Why do AOA publications refuse to publish any articles that discuss or question AOA actions and policy? 6. Why is AOA embracing all HHS/CMS policies even before they are written, like pay for performance (P4P) when these policies are being used to deny payment to good practicing physicians instead? 7. Why is AOA complicit in the financial capture of medicine by so-called “stakeholders;” insurance companies, hospital health systems, government, HIT and corporate interests and insistent on excluding patients and physicians in private practice as stakeholders at all? 8. Why is AOA complicit in the regulatory capture of the practice of medicine by government, thus losing all true Osteopathic practice, their professional integrity, and our entire DO professions underpinnings? 9. Why doesn’t the AOA present it’s member DOs with all options of practice including private direct pay options where the patient-physician relationship is paramount and sacrosanct? 10. Why doesn’t the AOA support private independent Osteopathic Medical practice against the competing interest of all others? 40 of the most relevant resolution proposed follow. Please review those of interest to you and make your opinion(s) known to our representative this week. When will the ACOFP decide to start advocating for physicians? Will you be discussing how performance measures takes time and energy away from patient care? Will you be discussing how it is third party performance measures that you are endorsing which takes away from patient care and raises greatly the cost of business in a practice? Will you be discussing how many physicians are terminating their contracts with insurers and working directly with patients to avoid the intrusions into patient care? Will you be discussing how many physicians are planning to retire early because they are tired of dealing with third parties and just want to be physicians who treat their patients? If you do not discuss any of the above issues then you are missing the boat. As an Osteopathic physician, and as my father who was an Osteopathic physician before me, we did not go into practice to work for government or third parties. When will the ACOFP decide to start advocating for physicians, instead of abdicating our authority and treatment choices to third parties? I would be happy to discuss any of the above matters with you at any time. Please call me at my office.